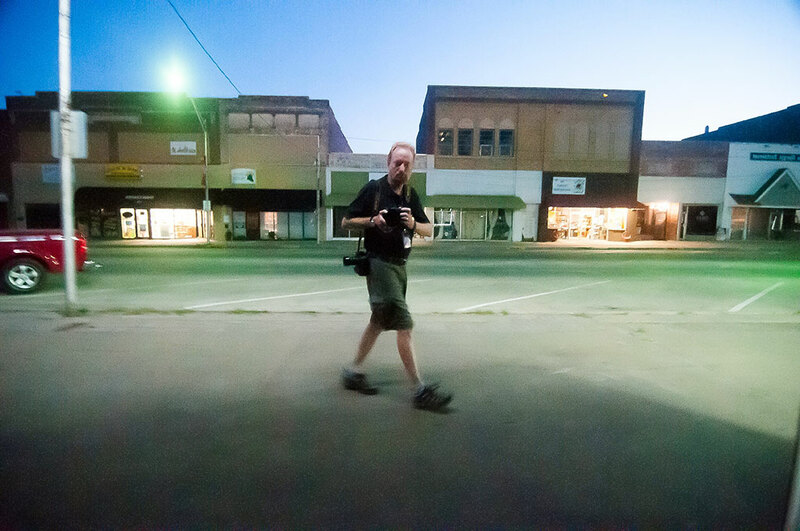 I thought this image of myself reflected in downtown windows at dusk was dreamlike. My wife Abby and I both awoke thinking we heard whistling. She even seemed to hear a tune being whistled, which was too weird to ignore. I got my Ruger P95 9mm, which has a Streamlight on it, and swept the house for intruders. “Is it clear?” she asked when I came back to bed. Of course it was, I explained, since if I had found a home invader, I would be holding him at gunpoint and asking Abby to cover the sector behind me and call 911. Maybe that’s an important difference city life and country living: in the city, you might threaten a potential assailant with a call to the police or to scream, where in the county, we tend to offer the choice between surrender or death, since we know the police could take as much as 30 minutes to arrive. I was even able to determine that Hawken, the back yard Irish Wolfhound, was fine when I looked through the blinds at him eating some kibble. We speculated the whistling could have been an owl, a dove, the cuckoo clock, the police scanner, or a dog tummy, but Abby swears it was a tune. None of the dogs reacted to the sound in any way, so my best guess is that one of us, probably me, was dreaming about whistling and whistling out loud. Back in bed, I dreamed I was a dog handler at a wedding, in charge of a giraffe-sized Irish Wolfhound. A one point, he felt faint, so I game him a bowl of elbow macaroni and milk. Those thoughts are from last night. Yesterday on the way to the grocery, Abby and I got to reminiscing about a recent nail-clipping disaster with Sierra the Chihuahua. I told Abby about the mistakes I made when doing it, and to clarify, she asked, “Was the ‘the bloodbath’?” We laughed and laughed at that, since we now have an event in our lives we will remember as The Bloodbath. 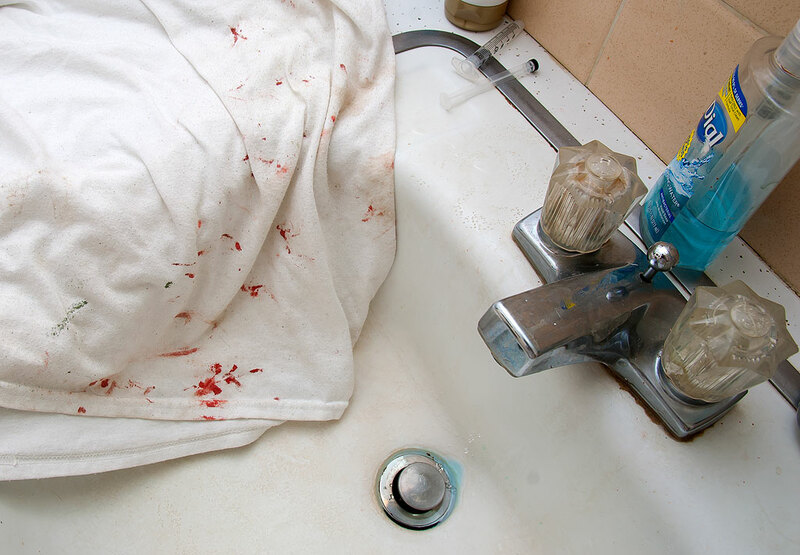 This is a t-shirt I used to try to clean up the blood from our nail-trimming fiasco in November, known from now on as The Bloodbath. Another difference, I’ve learned, is that in the city, any noises I hear at night are 99.9% likely to just be inconsiderate people doing loud things at night. In the country, there is no expectation of such noises, so they have to be taken seriously. My brain has been trained in *both* spots, so my fight/flight instincts are not always helpful. Sigh. And yes, that image is a little dreamish. I refuse to cut dauphine’s nails because I’m so afraid of this very thing. Our vet does it.